Your kid doesn't want people wearing her name out. And if they do... especially by saying it three times (if they're foolish enough to make such a grave mistake)... she can pop up in this awesome Girls Beetlejuice Costume and scare the heck out of them this Halloween! This suit is ideal for those trick-or-treaters who like their outfits with some imagination and pop culture panache... and you can never go wrong with Beetlejuice, one of the most memorable, funny, and creepy characters from all of '80s cinema! The dress is modeled after Beetlejuice's signature suit, with black and white vertical stripes and a black necktie to cap it all off. It'll make your little trickster instantly recognizable as the female counterpart of the character that helped put Tim Burton on the map... and scared the living daylights out of Winona Ryder's hapless family! It's perfect for her devilish and playful style, since that's what old Beetlejuice (uh... we just noticed that we've said it more than three times in this description now. We're waiting for our bannister to turn into a snake any moment now. Gulp) is famous for! Your girl will truly be the ghostess with the mostest this Halloween when she hits the neighborhood in the Girls Beetlejuice Costume (okay, that's like... five times now, and he still hasn't appeared... fingers crossed)! 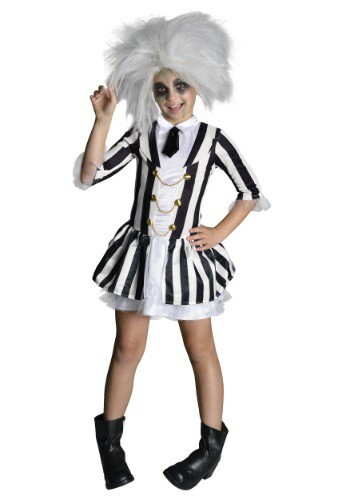 Just don't forget to grab the Beetlejuice wig (at this point we doubt he's showing up. Well, we hope) and makeup to complete that iconic look!